Piqua, Ohio, Feb. 11, 2014 – Hartzell Propeller Inc. and Cirrus Aircraft have entered into a five-year extension of an exclusive supplier agreement to provide propeller systems and governors for all of Cirrus Aircraft’s new prop-driven airplanes. The agreement extends a relationship between the companies that began in 1996. It was then that Hartzell began working closely with Cirrus to develop high-performance, low noise two- and three-blade propellers for the SR20 and later developed a new advanced three-blade structural composite propeller that helped launch the SR22. These propellers became the precursor for Hartzell’s blended airfoil technology. Under the extension, Hartzell will continue to provide Cirrus with three-blade metal propeller systems for the SR20 and SR22 and three-blade composite props for the SR22T, all single-engine aircraft. Hartzell expects to provide Cirrus with more than 250 propeller systems annually under the extension. Value of the contract was not released. Cirrus Aircraft is a recognized leader in general aviation. 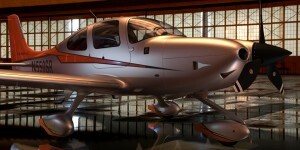 Its all-composite line of personal aircraft – the SR20, SR22 and the turbocharged SR22T – incorporate innovative and advanced performance electronic and safety technologies, including Cirrus Perspective™ by Garmin® avionics and the unique Cirrus Airframe Parachute System™ (CAPS). To date, total time on the worldwide Cirrus Aircraft SR-series fleet surpassed five million flight hours with 85 lives saved as a direct result of CAPS being a standard safety feature on all Cirrus aircraft. All Cirrus aircraft are made in the U.S. with a direct sales force in North America and authorized sales centers covering export markets in 60 countries around the world. Cirrus Aircraft is wholly owned by China Aviation Industry General Aircraft Co., Ltd. (CAIGA). For additional information on Cirrus and its products, please visit Cirrus Aircraft.